Residents of Binyamin region say refusal to allow them access to road has depreciated home values, created unbearable traffic jams. 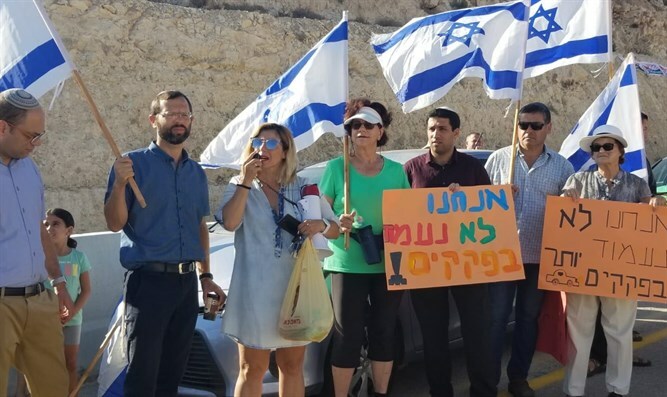 Dozens of residents of the towns of Anatot and Adam in Binyamin demonstrated Friday morning to demand the opening of the 'ring road' which connects the Anatot military base to Jerusalem. The road would allow residents to drive to the capital in just a few minutes. The 'ring road' has been closed to traffic even though it was paved 13 years ago and recently extended to reach the French Hill neighborhood in Jerusalem at the cost of NIS 40 million (about $11 million). The road has remained closed due to a dispute between the government ministries and the failure to recruit security guards for inspection posts along the road. "Route 437, on which we have been traveling for many years and which leads to our community, is a dangerous road for our security. Many of us have experienced riots, stone throwing, the throwing of Molotov cocktails and other kinds of violence," the demonstrators stated. "In addition, there is not one of us who has not experienced unbearable traffic jams while driving to work or [bringing our kids] to school in Jerusalem. Every time there is an accident on the road it causes it to close for many hours. This has caused our homes to significantly depreciate in value. The opening of the road is expected to greatly improve the value of our assets in Binyamin. The situation is unbearable. We are fed up," the residents added. 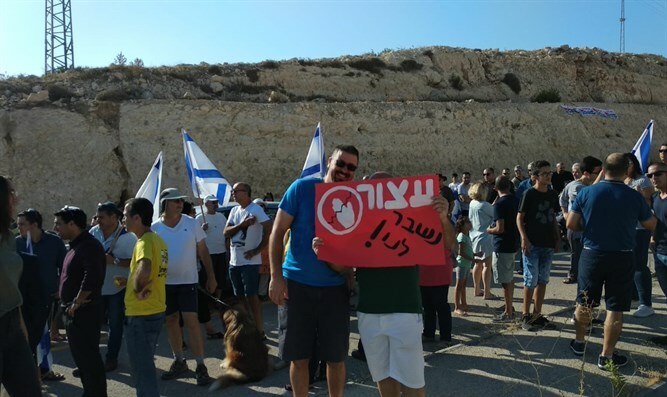 The demonstration was attended by Binyamin Regional Council Chairman Avi Roeh, his deputy Yisrael Ganz, Jerusalem Deputy Mayor Ofer Berkovitz, and other public figures who demanded that the road be opened immediately. Yisrael Gantz, who is running for the chairmanship of the Binyamin Council, said: "This is another step in the struggle which we have been fighting along with the residents for a long time. We are not prepared to continue living with the clumsiness of the government ministries. It is inconceivable that battles between ministries will be conducted at the expense of the residents." "The budget is there. Recruiting security guards is not a problem. I call on Minister Gilad Erdan to put an end to this failed behavior that harms the residents and to allow the opening of the road immediately before the start of the school year," Gantz added. Jerusalem Deputy Mayor Ofer Berkowitz said: "The opening of the road is part of a metropolitan transportation vision that connects the communities around Jerusalem to the city quickly and conveniently ... with minimal disruption to the routine travel within the neighborhoods. The 'great' Israeli government is expected to resolve such bureaucratic disputes quickly and allow the opening of the road."